The Citadel, a film released in 1938, marked a few important events. First of all, it was the last time Rosalind Russell would play a British woman. After this film, she only played Americans (with the exception of the Russian Jewish mama in A Majority of One), but still with her very unique way of speaking. Secondly, the premiere of The Citadel in London was the first time Frederick Brisson, her future husband, caught a glimpse of her. He said he and his friend stretched their necks, trying, in a glimmer of hope, to see a real, live movie star. Neither of them had any idea they would fall in love and be married just 3 years later. When Rosalind arrived in London to film this British movie, she was not exactly welcome. Everyone in the cast (Robert Donat, Ralph Richardson, Rex Harrison, and so on) were British, except for the female star (Roz) and the director (King Vidor). The film revolved around the miners in a Welsh mining town, and so the labor unions were in an uproar about the main actress and director not being authentically British. 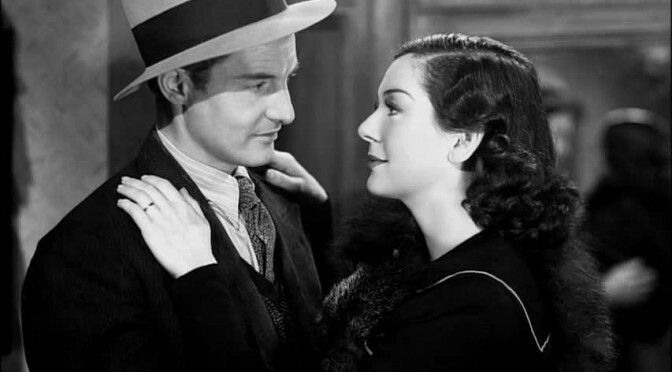 She gave a good performance with several opportunities to turn on the waterworks, but being a doctor’s wife is clearly not where Roz excels, and the showstopper is Robert Donat, who was nominated for an Oscar for this role. Robert Donat plays Andrew Manson, a young doctor eager to start his first job. He has been hired as the assistant doctor in Dr. Page’s practice. Dr. Page (Basil Gill) is a very ill, old man who is confined to his bed, allowing his wife to take over everything. Andrew will be doing all the work at his practice because Dr. Page is simply unable to do anything. Andrew will be staying at their house while he works for Dr. Page, but he immediately gets a glimpse of what his life away from work will be like with the domineering, cruel Mrs. Page (Dilys Davies). Mrs. Page does not pay Andrew well for his hard work. She does not feel she has to treat him as well as he deserves because this is his first job and he shouldn’t expect much. She also starves him by giving him a very small amount of food at mealtimes, while giving herself large quantities of food. He enjoys his work anyway, even though he comes up against some obstacles and disappointments along the way. He threatens to report her and she replies, “Well, then you better report me.” She asks her class to say goodbye and thank you to him, and as he leaves, she shoots him a withering look to show her dissatisfaction. That night, he tries over and over again to write out a letter to report Christine, but he can’t finish it. Soon after this, he delivers a stillborn baby and one can tell he is heartbroken over this bad reflection on him as a doctor. Just when he’s given in to defeat, he quickly gets some warm water in a basin and rubs the child desperately, giving him air into his tiny lungs until suddenly, the newborn baby has been given life, as everyone witnesses by the baby’s cries. Andrew smiles, immensely proud of himself for saving his first life. Nothing can shake the feeling of such elation as he walks away from the happy family. Another doctor named Denny (Ralph Richardson) befriends Andrew and they start to notice a pattern in the deaths from typhoid in town. Denny discovers that a large number of people were being stricken with typhoid because of the dirty, tainted water in the sewers. So what do they do? They make their own dynamite, throw it down into the sewers, and blow it up. They have done something very illegal, but necessary to prevent a complete typhoid epidemic. The next morning, Andrew sees Christine for the second time. She has come into his office to get a sore throat checked out, and it is obvious that although they were quite angry with each other in their first meeting, they seem rather fascinated with each other this time. Christine gushes about how wonderful it was that he saved a baby’s life. He thanks her, but acts like he doesn’t much care for anything she says. He tells her to sit down while he examines her throat. This scene will show anyone that despite the dramatic proponents of this film, Roz has a way of being funny anyway. She makes comical faces as she opens her mouth wide and says “ah” and coughs a few times for him. As he writes out a prescription for her and she leaves his office, they discover they have a mutual friend in Denny and Christine seems vaguely eager about riding bicycles with Andrew, but doesn’t ask him. She finally leaves and they both seems happy to have seen each other again. That same night, happy with his second meeting with Christine, he goes home only to have Hurricane Mrs. Page rip him a new one. He get into a very loud verbal argument and he starts insulting her, saying he’s fed up with her keeping portions of his salary from him and starving him to death. She fires him and he does one better: he quits and walks out as she continues screaming at him! Suddenly finding himself without a job, he hears about a mining town in Wales looking for a new doctor to treat the folks there. He interviews for the job in a room that includes the miners, who get a chance to ask the doctor questions and learn more about him. The man sitting next to him shooting him questions is named Owen and he is none other than Emlyn Williams, the one who wrote the plays Night Must Fall (1935) and The Corn is Green (1938), the latter made into a movie starring Bette Davis in 1945. As she sticks her head out of the upstairs window, she bursts into unrestrained laughter at the thought. She sees he is serious and although she loves being a teacher, for some reason or other (and still snickering), she agrees to marry him so he can have the job. Soon, they arrive in the Welsh mining town where he will be the doctor. They install themselves in their new house and not long after they have become settled, there is a cave-in at the mines and Andrew is hard at work underground, saving lives and helping the gravely injured. Christine rushes toward him, crying and so relieved to see him alive. This is the first of several occasions in which Christine has cause to burst into tears. While working in the mining town, Andrew starts to notice a tremendous outbreak among the miners of tuberculosis. After some initial research, Andrew figures out that they are getting it from the silica found in the coal down in the mines. Since nobody is willing to start searching for a cure or treatment for the disease, Andrew and Christine set up a lab in their home, using the treasured microscope Denny gave him. When Andrew isn’t working in town, he is doing experiments in their secret lab while Christine assists him. They test their findings on guinea pigs. Now, I am not sure if what they were testing was humane toward animals, but I am sure no animals were harmed during production of the film. You don’t even see the actual guinea pigs, although in my most recent viewing of the film, I noticed Rosalind Russell calls one of the guinea pigs “Clara,” something she tended to do in her films. She mentioned the name “Clara” a few times throughout her career in different ways as an homage to her sister Clara and probably also to her mother, who was also named Clara. One day, all hope is shattered when a group of men break into Andrew and Christine’s home when Christine is home alone. Through her abundant tears, she tells Andrew that the men just burst in, broke all their slides and samples, and took the guinea pigs. It was after this fiasco that Andrew and Christine got themselves out and moved to a bigger city, where Andrew opens up his own medical practice. They live in a tiny apartment and Andrew has a lot of trouble getting patients and so they are living hand to mouth at this point. Even so, Christine doesn’t mind the struggles at all. She loves all the locals, especially an Italian woman named Mrs. Orlando (Mary Clare) who runs an Italian restaurant in town, which she and Andrew consider to be the best food. She and her young daughter Anna are very kind and hospitable and they all become friendly. One day, Andrew is called over for an “emergency” at a store. He finds a young woman named Toppy LeRoy (Penelope Dudley Ward) lying on the floor, screaming and obviously throwing a temper tantrum. He finds it quite distasteful for a grown woman to throw a temper tantrum in public like that and he promptly slaps her face a few times. This brings her out of it, at least. This is how Andrew suddenly becomes immersed in the lives of the spoiled rich. He meets an old classmate of his, Dr. Lawford (Rex Harrison in a very early role) in an elevator and he asks him to come over to the hospital with him. It becomes apparent that these doctors are mainly concerned with large salaries and benefits of serving the rich and famous and not with curing people or saving lives. It isn’t long before Andrew becomes one of them and starts bringing home expensive presents for Christine, like some beautiful furs. When Christine sees things in the mail like checks made out to Andrew just for being present at operations without even doing anything, she becomes suspicious. She can see Andrew is not the same man she married and is more enamored with money than anything else. The next day, they have a beautiful picnic on a hill and she starts telling Andrew that she doesn’t want to have a rich lifestyle and she misses their old life. She explains, “Remember the way we used to talk about life? It was an attack on the unknown, an assault uphill, as though you had to take some citadel you couldn’t see but you knew was there.” After they meet up with Denny, whom they haven’t seen in a long time, he tells Andrew about his new idea of taking only small amounts of money from patients (what they can afford), so they can still receive the care they deserve. Andrew turns him down for the partnership and Denny can see the change in him as well. Although Denny was doing well with his sobriety, he suddenly goes off on a bender and in his drunken stupor, he gets hit by a car right in front of Andrew and Christine’s apartment. They both rush to the hospital and Andrew assists in the operation to save Denny’s life. However, the doctor performing the operation is one of those catering to the rich and famous and obviously does not try very hard to save Denny’s life. Denny is gone and that’s life—that’s his philosophy. Andrew tells him that “that wasn’t surgery, it was murder” and heartbroken that he has just lost his best friend, takes a very long, mind-numbing walk through town, thinking about the tragic circumstances that have just struck his life. He thinks about who he has become and who he used to be. He realizes he is a sliver of a shadow of the man he used to be and promises himself he will do better. After his despairing walk, he remembers that Mrs. Orlando told him about her daughter’s hospitalization for an illness of her lungs and although he ignored her then, he will not ignore her now. He heads for the hospital and although it’s highly unethical, he snatches her from her hospital bed and making sure Mrs. Orlando tells the doctor that she is dissatisfied with his care, takes her out of there. It isn’t long before Anna is well and dancing just like she used to.